With less than one year on the scene, the young designer of fashion shades also has an eye on the clothing and accessories market. Dass, the daughter of Vincentian parents, markets her successful JAM Sunglasses business from New Jersey, United States, where she resides. Here at home on some personal time, Dass visited Searchlight on Monday, January 31, with some of her eye catching designs, and indicated that big things are in store for 2011 and beyond. The former student of the Girlsâ High School said that what started out as a hobby for her, took off after her first showing at Fashion Caribbean here in St. Vincent last year. âLast summer, I wanted to come to St. Vincent for vacation. I bought a pair of designer glasses from a guy who was designing and he never sent it to me, so I decided I wanted to do it for myself; and I did, and that was it,â Dass explained. 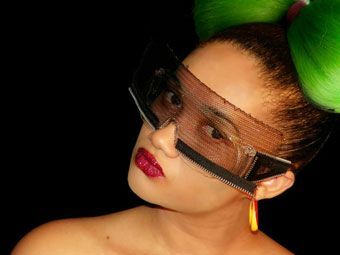 After that, Dass said that she did a professional photo shoot and created a website for her designs (www.jamsunglasses.com,where the favourable reviews continued to pour in. Since her breakout, the designer has been featured on a number of blogs and in fashion magazines such as Style Italian, Kiss and Vanity Idol. Her pieces have also been worn by the Whoâs Who on the celebrity scene in the United States; these include rapper Snoop Dogg, socialite Amber Rose, along with other singers, actresses and models. Her sunglasses can also be seen in a number of music videos, including that of rapper Lil Zane, which is slated to be out this summer. Dass, who says her ultimate goal is to have her designs worn by pop idol Lady Gaga in the not too distant future, plans to take her sunglasses on tour to Europe and Africa, where she says her creativity is being embraced. Admitting that her artwork could be called outrageous by some, she said that one would be surprised by the huge demand for her product, by persons who want to stand out in the crowd when they get into the limelight. The young entrepreneur is currently pursuing her second Masterâs Degree in mental health, while balancing the attention her eyepieces are attracting. She says that she would not have it any other way.